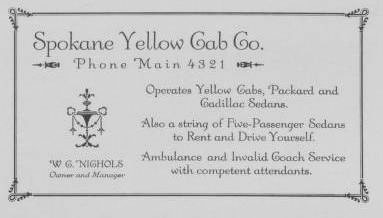 Operates yellow cabs, Packard and Cadillac sedans. Also a string of five-passenger sedans to rent and drive yourself. Ambulance and invalid coach service with competent attendants. W.G. Nicholas. Owner and manager. Phone Main 4321. 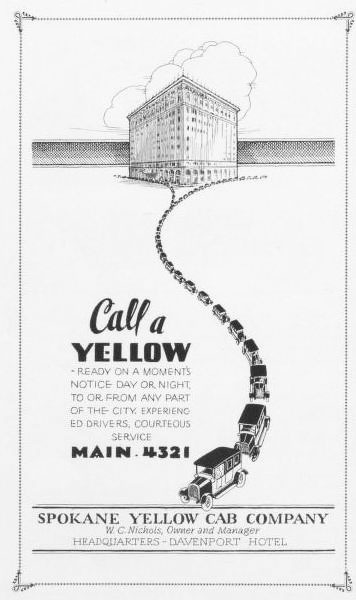 Call a yellow. Ready on a moment's notice day or night to or from any part of the city, experienced drivers, courteous service. Main 4321. W. C. Nicholas, owner and manager. Headquarters - Davenport Hotel.